According to one of the two security guards standing watch of the Whitney viewing stand in the early morning hours of a weekend racing day, about 200 visitors each day have climbed the stairs to take in the action at the Oklahoma training track. Anna Saccoccio of Cranston, RI and her horse racing buddy Ann Arch of Smithfield, RI are two of the 200 people who came the first day it was open. 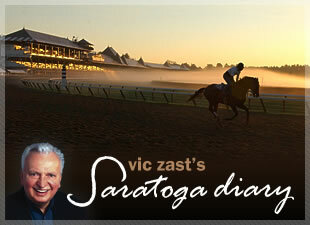 Both women come to Saratoga each summer for the Whitney. But they have rarely been able to see the morning workouts at Oklahoma because of an exclusionary policy. Arch’s dad was the bugler at old Narragansett Park, which should explain her interest in the sport. “The view is beautiful from here. If not for the viewing stand, we probably wouldn’t have this chance,” she said. The facility will improve in delivering memories when someone wakes up to the fact that a garden surrounding the tower violates the prairie serenity of the landscape and when it’s figured out how to limit the mud on the mahogany stairs after an overnight rain. But even without those improvements, great progress in connecting the public with the horse has been made. 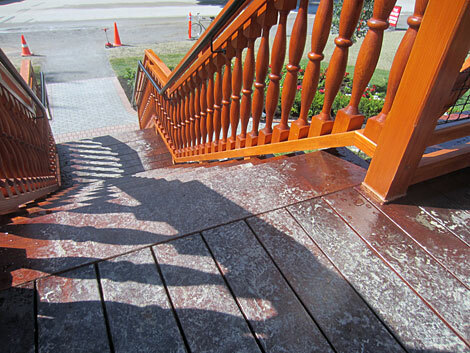 A few housekeeping issues such as preventing the mud being tracked up the stairs from making the stairs slippery need to be worked out. Sunday was Day Two of the Fasig-Tipton Festival of Racing and Day Final of the successful Whitney Stakes weekend. The meet’s leading rider Joel Rosario recorded three more victories in the saddle. For the second consecutive day, trainer Chad Brown swept both ends of the Daily Double. He also won the seventh. 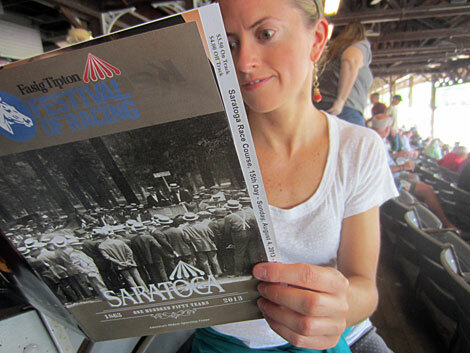 Cover of the Saratoga racing program features a photo of one of the early Fasig-Tipton Yearling Sales. Other noteworthy winners were Enquette, a good-looking two-year-old filly by Indian Charlie from the Todd Pletcher barn, and Majestic Hussar, this spring a Kentucky Derby prospect. In the Majestic Hussar heat, Godolphin Racing’s Consortium forced the lead from the six hole and then, on the turn before heading home, veered to the starboard. He finished last, collapsed after passing under the wire and was brought around quickly with water. Trainer Steve Asmussen watched the horses warm up for the feature from his favored position at the top of the stretch. By the time the field loaded the starting gate, he walked half way back to the wire. He made the winner’s circle in time to accept the Alfred G. Vanderbilt Stakes (gr. I) trophy for Justin Phillip. None of the race’s five runners had won a Grade I stakes before. Someone in the food service department had the good sense to place a couple highboy tables in front of Restaurant Rows to let people eat what they bought in comfort. But why only a couple? On the other hand, NYRA restricted fans to see the 2004 Kentucky Derby winner Funny Cide in the walking ring from between 11:00 AM until Noon. That’s like inviting guests to breakfast at midnight. Joel Quenneville, coach of the Stanley Cup champion Blackhawks, attended the races on Saturday. Another guy from Chicago, Jerry Berliant - a disbarred attorney who’s become the country’s number one gate crasher - was spotted in the walking ring on Sunday. Berliant’s here uninvited, of course, for the Yearling Sales. 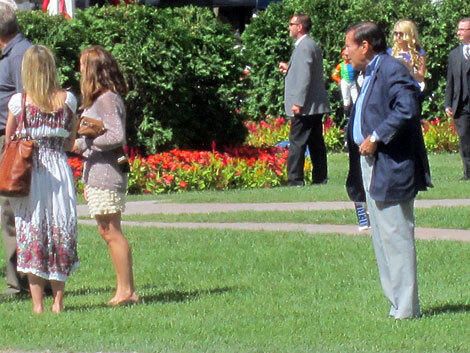 Jerry Berliant, the country's number one gate crasher, (on the right) in the walking ring.